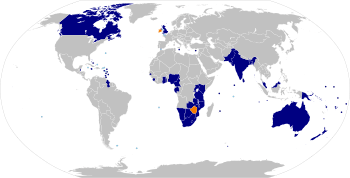 Today, March 10th 2014, is Commonwealth Day in the countries that are members of the Commonwealth of Nations. Traditionally, in London, Queen Elizabeth II leads a celebration at Westminster Abbey on Commonwealth Day along with the Commonwealth Secretary-General, and the Commonwealth High Commissioners. Her Majesty is the Head of the Commonwealth, and normally reads a speech in honour of the occasion. The day is not an official holiday in most jurisdictions, although I call on all Commonwealth nations to do so. The day does celebrate the group that binds us together. So, let’s celebrate Commonwealth Day! This entry was posted in General and tagged Antigua and Barbuda, Australia, Bahamas, Bangladesh, Barbados, Belize, Botswana, British Overseas Territories, Brunei, Cameroon, Canada, Commonwealth, Commonwealth Day, Commonwealth Nations, Commonwealth Secretary-General, Cyprus, Dominica, Elizabeth II, Ghana, Grenada, Guyana, Head of the Commonwealth, India, Jamaica, Kenya, Kiribati, Lesotho, Malawi, Malaysia, Maldives, Malta, Mauritius, Mozambique, Namibia, Nauru, New Zealand, Nigeria, Pakistan, Papua New Guinea, Rawanda, Saint Kitts and Nevis, Saint Lucia, Saint Vincent and the Grenadines, Samoa, Seychelles, Sierra Leone, Singapore, Solomon Islands, South Africa, Sri Lanka, Swaziland, Tanzania, Tonga, Trinidad and Tobago, Tuvalu, Uganda, United Kingdom, Vanuatu, Westminster Abbey, Zambia. Bookmark the permalink.